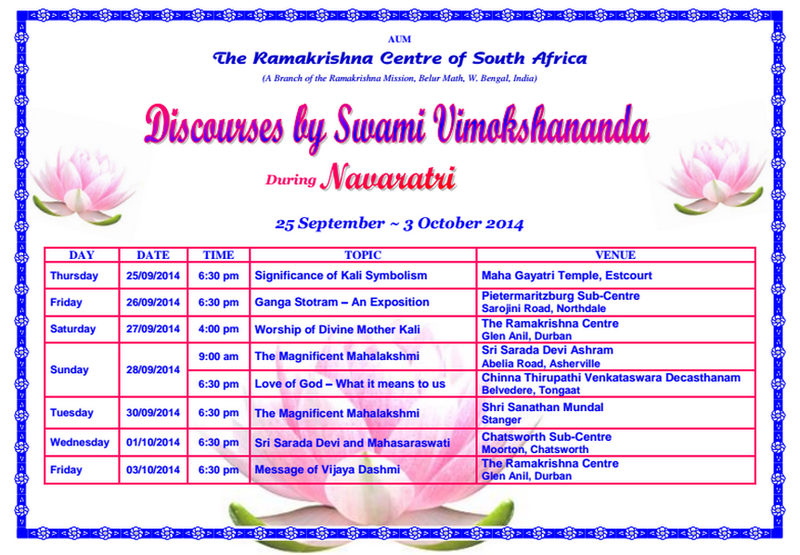 After Estcourt, the second day of Navaratri was spent in Pietermaritzburg Sub-centre. I was treated to ideal idlis for the morning breakfast…The deco inside the shrine was so charming. A good number of devotees had assembled. Barry was the MC for the function. Here I narrated why navaratri was for nine nights. Talking about how Parvati got the name ‘Gauri’ as amusingly told by one of our puranas, my speech turned towards Ganga. I asked Avitha, one of the senior devotees to lead the singing of ‘Ganga Stotram’ which was written by Adi Shankaracharya. This hymn with lilting tune was so mellifluously sung by all captured my imagination. I took three verses at a time for explanation while Sonal read out the English meaning of each verse. The poetic excellence with the inherent spiritual meaning of these wonderful verses made every one forget the time.